Tag line: "You know all about hunting trips, don't you?" 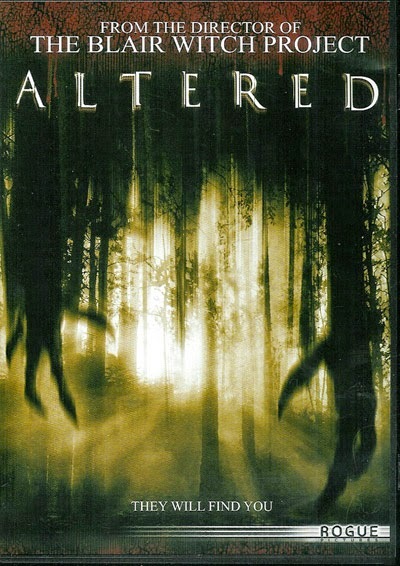 Directed by Eduardo Sanchez, one of the creative minds behind 1999’s The Blair Witch Project, 2006's Altered is a nifty sci-fi / horror film about a group of guys seeking revenge on the alien creatures that abducted them 15 years earlier. After successfully capturing an alien, Duke (Brad William Henke), Otis (Mike C. Williams) and Cody (Paul McCarthy-Boylington) toss it into their van and drive to the home of their old friend, Wyatt (Adam Kaufman). Over a decade ago, all four, along with Cody’s brother Timmy, were on a hunting trip when they were kidnapped by aliens and subjected to a series of tests. Duke, Otis and Cody were released almost immediately, while Wyatt and Timmy remained on-board the spacecraft for hours. The ordeal cost Timmy his life (Wyatt, who was the stronger of the two, was eventually released, stark naked, a few counties away). Of course, nobody believed their story, and as a result Cody was imprisoned for several years, accused of killing his own brother. Hoping to forget what happened to him, Wyatt withdrew from his friends. In fact, before they pulled up in front of his house with the captured alien, he hadn’t seen them in years. Now living with his girlfriend (Catherine Mangan), Wyatt had hoped he could put the past behind him, but thanks to his three former pals, he’s about to face one of the creatures that nearly destroyed his life. But as Wyatt will discover over the course of one very intense evening, the aliens are as frightened of him as he is of them. The question is: why? Altered kicks off in exciting fashion, following Duke, Otto, and Cody as they track down the alien. Set in the middle of the woods, it’s a terrifically tense sequence (at one point, Duke and the creature are only 10 feet away from one another, each with their foot caught in a bear trap. As the pissed-off extraterrestrial creeps towards him, Duke grasps for his shotgun, which has fallen just out of his reach). From there, the action shifts to Wyatt’s house, which is ultimately where 90% of the movie takes place. Yet despite its single location, Altered manages to keep the suspense strong, with the alien doing everything it can to break free (from the start, it’s clear the creature is much stronger, and a whole lot smarter, than his human captors). Naturally, chaos ensues the moment it manages to do so (the alien eventually sneaks into Wyatt’s bedroom and gets the jump on one of his pals, resulting in what is easily the film’s most shocking scene). Along with its solid performances, Altered boasts impressive make-up (one character is bitten on the arm, resulting in a nasty infection that slowly eats away at his body) as well as some stunning creature effects (an interesting take on the “little green men” stereotype, the alien looks more frightening with each passing scene). These elements, coupled with the filmmaker’s no-nonsense approach to the story (there’s hardly any humor at all), make Altered one hell of a thrilling motion picture. I haven't seen this one, but reading your review and hearing you talk about it on the Horror Movie Podcast, has definitely made me interested to check it out!